"One of the worst hurricanes ever to strike the Florida Big Bend and Panhandle region." 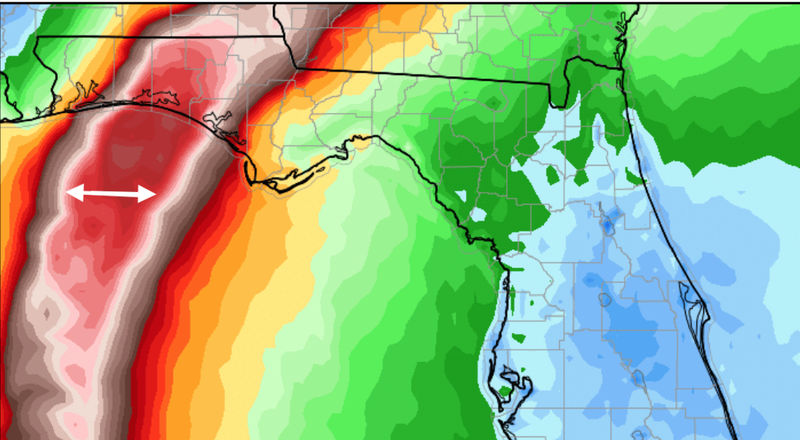 Michael will be a major hurricane at landfall. It is rapidly organizing near the west tip of Cuba right now. 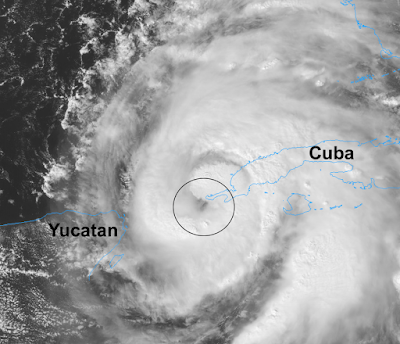 The storm is developing an eye near the west tip of Cuba (circled, see below). It is rapidly intensifying and will accelerate its forward speed tomorrow. Satellite image from 2pm. 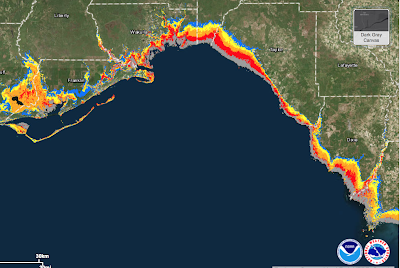 Currently, the National Hurricane Center is forecasting sustained winds of 120 mph at landfall. They may have to raise this a little on their 5pm advisory. Below is what the wind path may look like keeping in mind the path could shift a bit east or west. One of the things the models are showing is that gusts above 100 mph may occur into far southeast Alabama and far southwest Georgia. This is due to the rapid speed of movement of the storm. 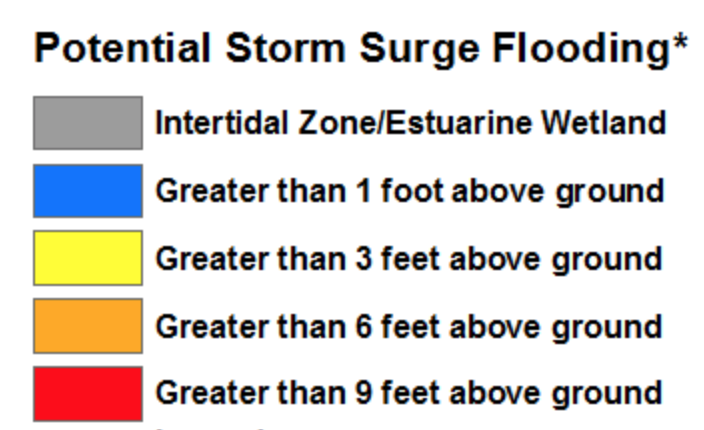 The storm surge with this storm is going to be a major danger in addition to the wind. 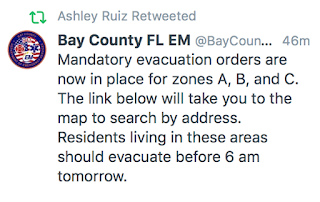 Evacuation orders have gone out. I urge you to follow them. What Do I Do Now™?? Before leaving, throw out any expiring food, clean cat litter boxes, empty all trash cans in the house, including bathrooms. Otherwise the odors could be bad when you return. Gather your utility bill (proof of current residency! ), passport and any other important papers so you can take them with you if you should have to evacuate due to the hurricane’s winds and/or the hurricane’s flooding. If you are in the hurricane wind area, see this information for preparing your home. Batteries for everything. Lots of batteries. Full charge for cell phone and laptop. Keep them fully charged. If you can get an electrician to install a generator, get it done. Do not try to install a generator yourself. If you have a wood-burning fireplace and you know your chimney is clear, get wood. Keep some indoors to keep it dry during the storm. You may need it to heat your home, especially since the power failures could last for weeks in some area (i.e., toward the first of October). 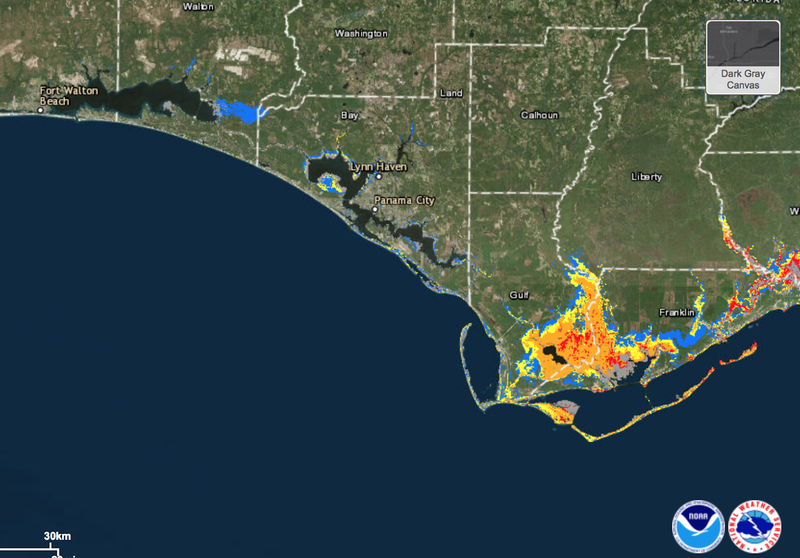 Have a paper map of the region as your first choice of evacuation routes may be cut off. If you live in a heavily wooded area, does someone in your vicinity have a gasoline-powered chain saw? Does it have fuel and a reasonably good chain/blade? Test it, now. I will update again early this evening.